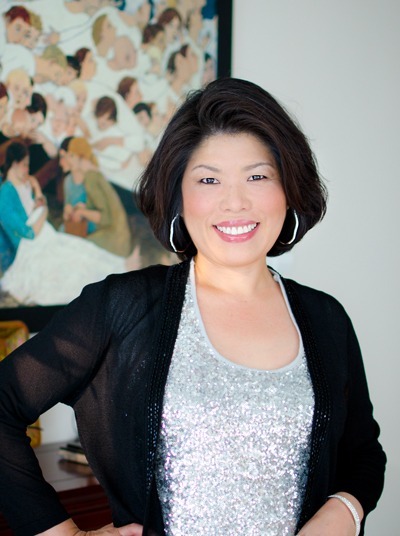 I was contacted by Lisa from Korean American mommy blog and she invited me to post a dinner idea for her “Around the world dinner” on Korean food. 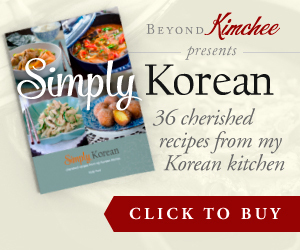 Her blog is awesome, full of good healthy recipes for both Korean and other cuisines. 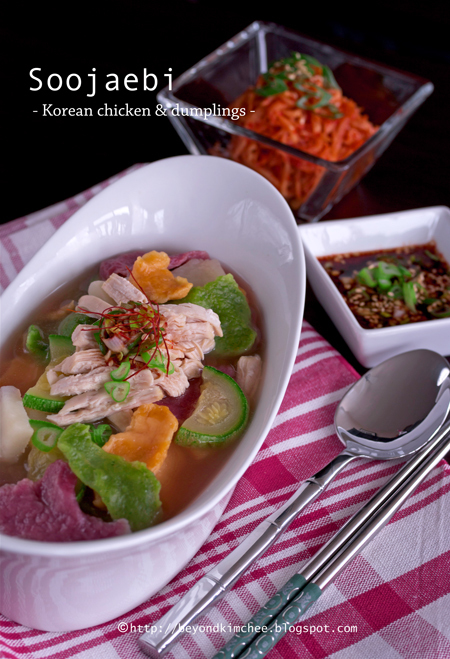 I am happy to participate to show you the Korean version of chicken and dumpling. Before I start I am going to show you something pretty. 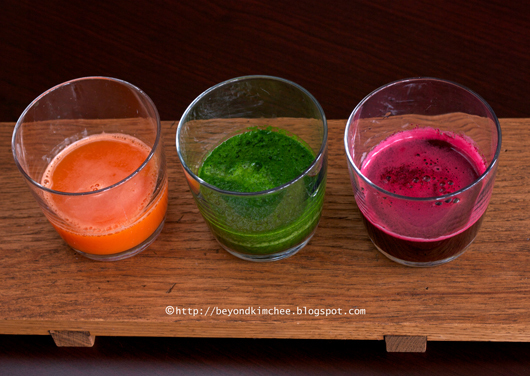 These are juices from carrot, parsley, and beet. I just puree them in the blender with little bit of water. Aren’t they pretty? Yup! I am going to add them to dumplings. The dish is called Soojaebi. Don’t let the # of ingredients in the recipe discourage you. It is actually easy and simple to make. With addition of these super nature food you will be glad that you are feeding your loved ones with something healthy, pretty, and yummy at the same time. It is fun to make with kids, too. Oh, by the way, you can use any vegetables that are rich in colors… pumpkin, spinach, purple potatoes, red cabbage, kale, etc. They all work great. Let people see the true colors of nature! Chicken split breast w/ bones, radish, onion, garlic, carrot, parsley, beet, potato, zucchini, flour, red chili flakes, Korean soy sauce, sesame oil, and sesame seeds. Whew! Did I include everything this time? First of all, juice your chosen vegetables with some water, each separately. FYI, I filtered the carrot puree in a coffee filter to get smoother juice. I didn’t filter the others. Prepare 3 mixing bowls. In each bowl, mix in 1 cup of flour, pinch salt, and the juice of one vegetable. 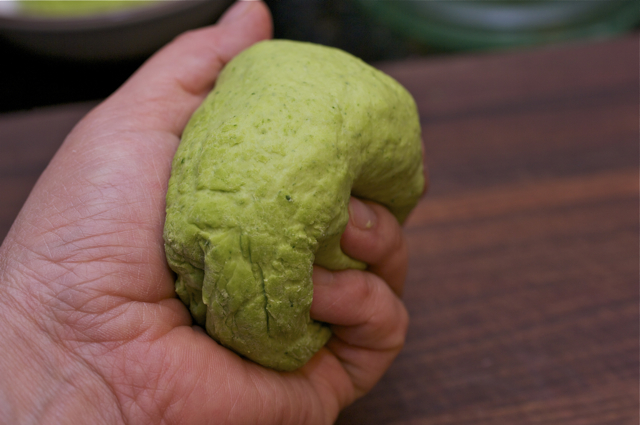 I added about 1/3 cup of juice and mix with fork, and then knead with a hand for 1 minute and form a ball shape dough. No need to be exact consistency but do not make them too sticky (more like bread dough consistency). You can use right away but cover with plastic wrap and chill for 30 minutes. It gives dumpling nicer texture. 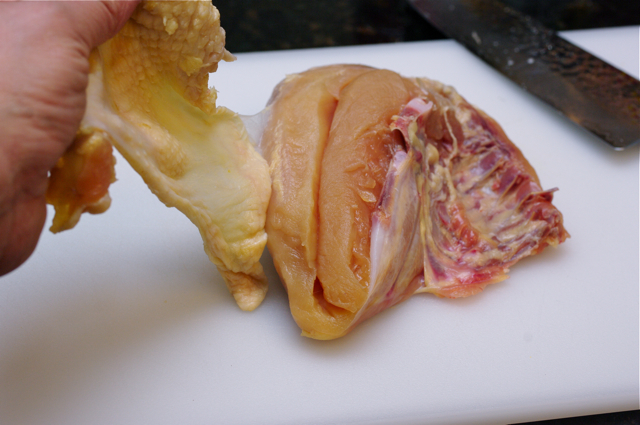 “May I take your coat?” Politely ask chicken to get her skin off. Cut up radish, onion, garlic and have them bath with chicken. Nothing like a hot spring in winter… Don’t you agree, Mrs. Hen? BTW, don’t skip the radish in the stock. It gives very nice flavor in the soup. After about 30 minutes she is well poached. 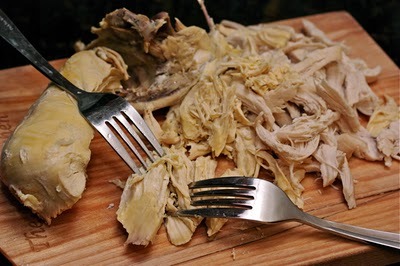 Keep the stock, discard everything except Mrs. Hen. Shred her and set aside. Make sauce to go with Soojaebi. 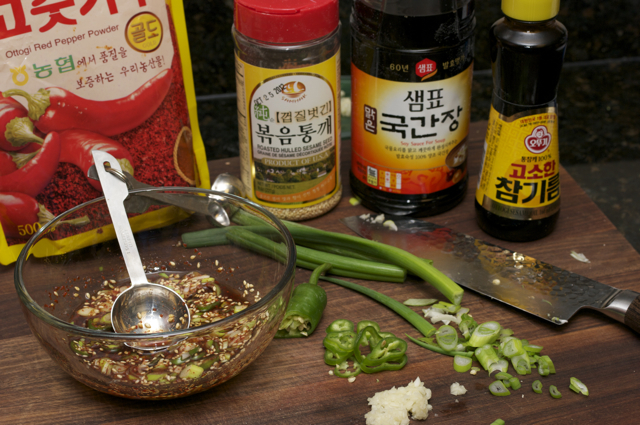 Just combine Korean soy sauce, Korean chili flakes, garlic, green onion, sesame oil and sesame seeds. Green chili is an optional. 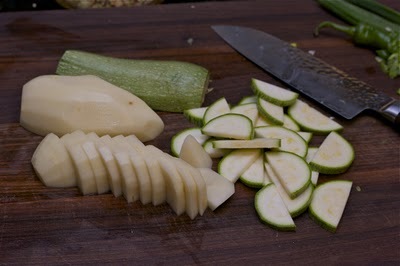 Cut potato and zucchini into 1/4″ thick slices. Bring the stock back to boil, add chicken, sliced potato, and zucchini slices. Take out the three gorgeous girls from the fridge and give them some squeeze. If you have little people at home, have them do the tearing job for you. 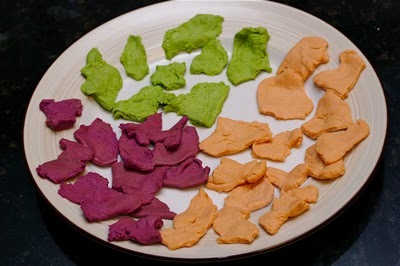 They think it is play dough… They can even roll out the dough and cut out with cookie cutter if they want. You know, if they make, they will eat. Kids are funny that way. Or just tear directly over the pot when the soup is boiling. They cook in no time, but you gotta work fast. Try to stretch out the dough thin and tear off. Boil for 1-2 minutes, done! 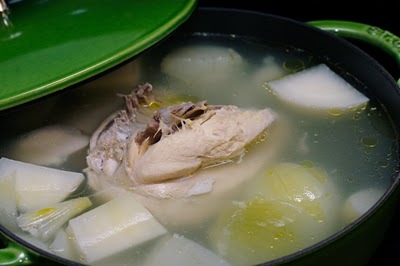 Serve the soup with sauce since the stock has no seasoning in it. 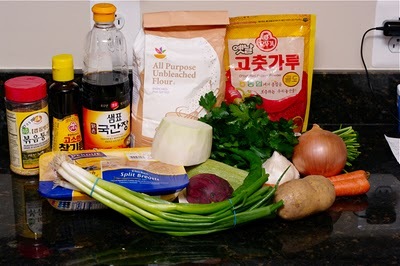 If you need to serve this to young ones, just add Korean soy sauce with sesame oil and some green onions. 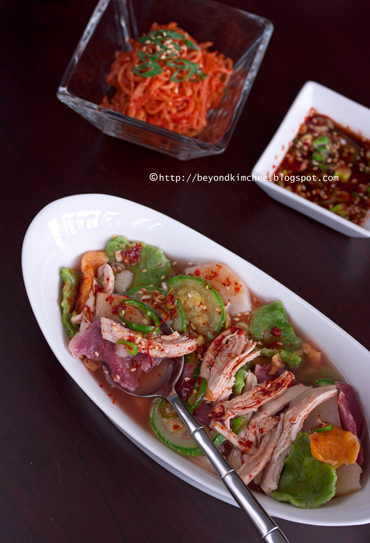 Cabbage kimchee or radish kimchee salad is perfect side dish (banchan) to serve with. Make sure you serve with the sauce. Just drizzle around the soup and mix. It is called 무우생채 (moowoo-sangchae), quick radish Kimchee salad. Very easy and quick to make. The recipe will follow below. Soojaebi once was a very humble food. 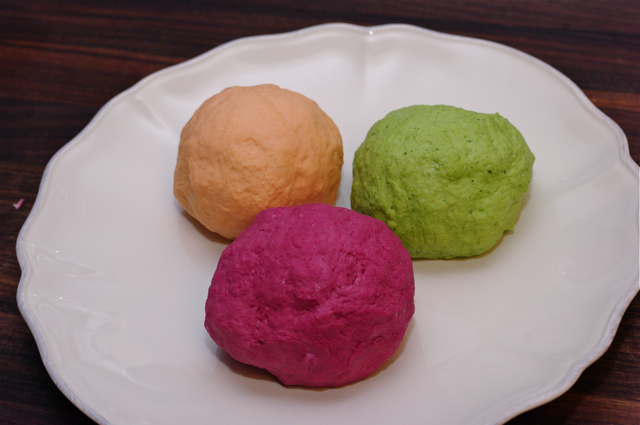 everyone had to eat plain Soojaebi. because it reminded them the harsh days of their young life. But I am changing the recipe to upgrade. It is no longer humble, it is fancy now for the time of abundance. 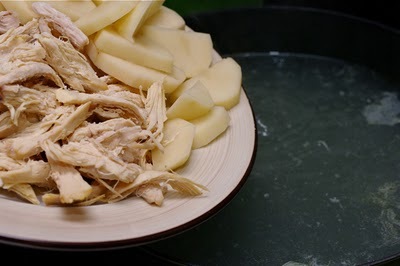 1 zucchini, sliced into 1/4"
1 medium potato, peeled and sliced into 1/4"
For the stock put all the ingredients in the pot, boil and simmer for 20-30 minutes. Strain the stock and reserve the chicken. Shred chicken and set aside. Meanwhile make dumplings. 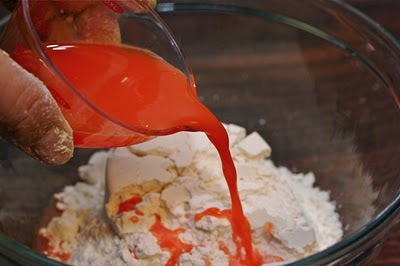 In 3 medium mixing bowls, place each bowl with 1 cup of flour and pinch salt. 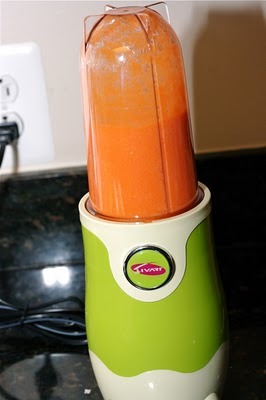 Pour 1/3 cup of each vegetable juice into bowls seperatley. 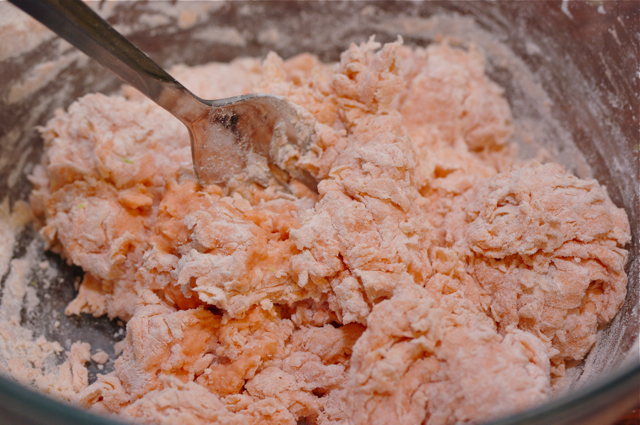 Mix with a folk until moistened and knead with hand for 1 minute in the bowl. Form a ball shape dough (you will get 3 different colored dough) and cover with plastic. Chill for 30 minutes if possible so the gluten can rest. Make sauce with given ingredients and set aside. 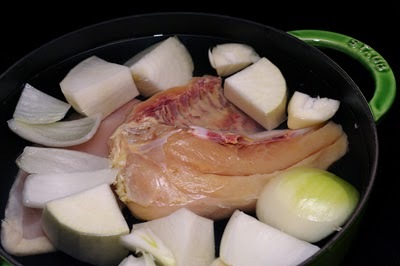 Return the stock to the pot and let it boil over medium heat. 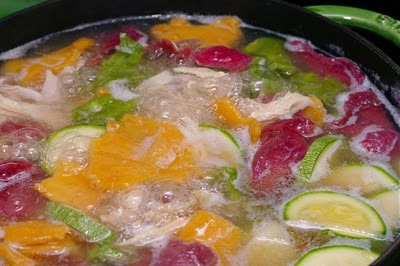 Add the reserved chicken, potato and zucchini slices and let it boil. Stretch the dough thinly with hand and tear off into bite sizes and drop into the pot. You need to work fast on this part. Cook for 1-2 minutes. 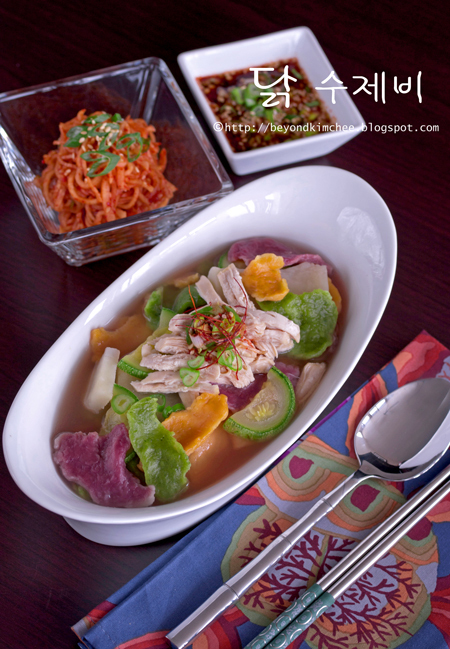 Ladle soojaebi into the individual bowls and drizzle the sauce over. 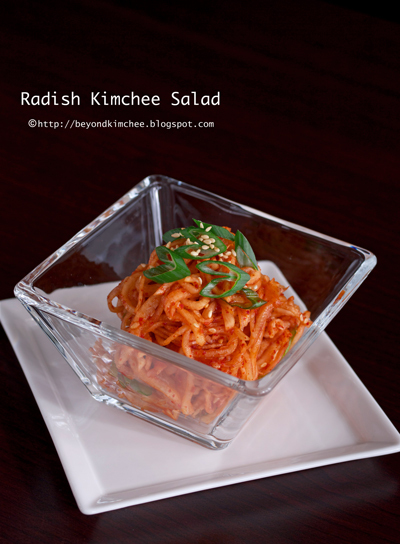 Serve warm with radish Kimchee salad or cabbage Kimchee as side dish. 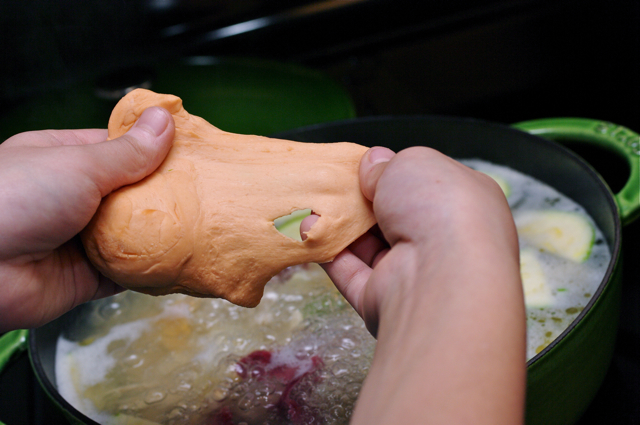 Note: You can tear the dough and place on a platter in advance before you boil the soup. Peel the radish and thinly slice them. Julienne the slices into 1/8"sticks. Place the radish into a bowl, toss with salt and let it sit for 10 minutes. You will see some water extracted from the radish. Rinse them with water and drain. Place the radish in a bowl again and add the rest of the ingredients. Toss well until they are well incorporated. Serve as side dish. They can be kept in the fridge for 1 week. « Bibimbap, fit for a king or a farmer?